Dr. No (1962) is a british spy film and the first James Bond film, starring Sean Connery, Ursula Andress and Joseph Wiseman. Based on the 1958 novel of the same name by Ian Fleming, it was adapted by Richard Maibaum, Johanna Harwood, and Berkely Mather and was directed by Terence Young. The film was produced by Harry Saltzman and Albert R. Broccoli, a partnership that would continue until 1975. Dr. No was produced on a low budget and was a financial success. While critical reaction was mixed upon release, over time the film has gained a reputation as one of the series’ best instalments. The film would become the first of a successful series of 24 Bond films. 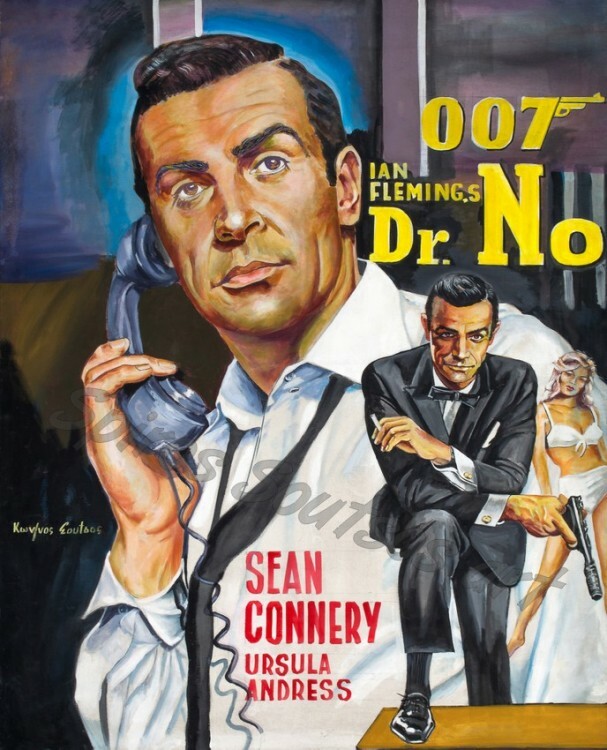 Dr. No also launched a genre of “secret agent” films that flourished in the 1960s. The film also spawned a spin-off comic book and soundtrack album as part of its promotion and marketing. Producers Broccoli and Saltzman originally sought Cary Grant for the role, they discarded the idea as Grant would be committed to only one feature film, and the producers decided to go after someone who could be part of a series. Richard Johnson and Patrick McGoohan were other choices but they both turned down the role. Another potential Bond included David Niven, who would later play the character in the 1967 satire Casino Royale. Ian Fleming favoured actor Richard Todd. In his autobiography, Cubby Broccoli said Roger Moore had been considered, but had been thought “too young, perhaps a shade too pretty.” In his autobiography, My Word Is My Bond, Moore says he was never approached to play the role of Bond until 1973, for Live and Let Die. Moore appeared as Simon Templar on the television series The Saint, airing in the United Kingdom for the first time on 4 October 1962, only one day before the premiere of Dr. No. Ultimately, the producers turned to 30-year-old Sean Connery for five films. After Connery was chosen, Terence Young took the actor to his tailor and hairdresser, and introduced him to the high life, restaurants, casinos and women of London. In the words of Bond writer Raymond Benson, Young educated the actor “in the ways of being dapper, witty, and above all, cool. The famous cpmposition”James Bond Theme”, which is heard in the gunbarrel sequence and in a calypso medley over the title credits, was written by Monty Norman based on a previous composition of his.